Mountain View Wellness, a place for Small Business, too! I see Mountain View as a place for people to come together in real ife! Being a small business owner, of course I hold small business generation near and dear to my heart. There is nothing quite like the courage it takes for someone to break out of the mold, decide to take a huge risk, to follow their dreams, and to open their own business. It is just those kind of people I enjoy spending time with. When I first began to ponder the idea of owning my own wellness center, I immediately knew I wanted it to be a place of community and support for those seeking wellness AND for those offering wellness. As months went on, Mountain Views signs went up, the doors opened, and people came! Over the last few months, I have had the amazing opportunity to meet with some very ambitious (and kind and loving) independent wellness practitioners. We of course, talked about their own wellness practices and how Mountain View could serve to be a space for them to offer their services, but we would inevitable turn to business. We would discuss questions about online scheduling, Mailchimp, websites, and even online promotion. After having a dozen or so meetings just like this, I believe it is time to for Mountain View Wellness to offer a place for such discussion and opportunity to the public. So here we go! 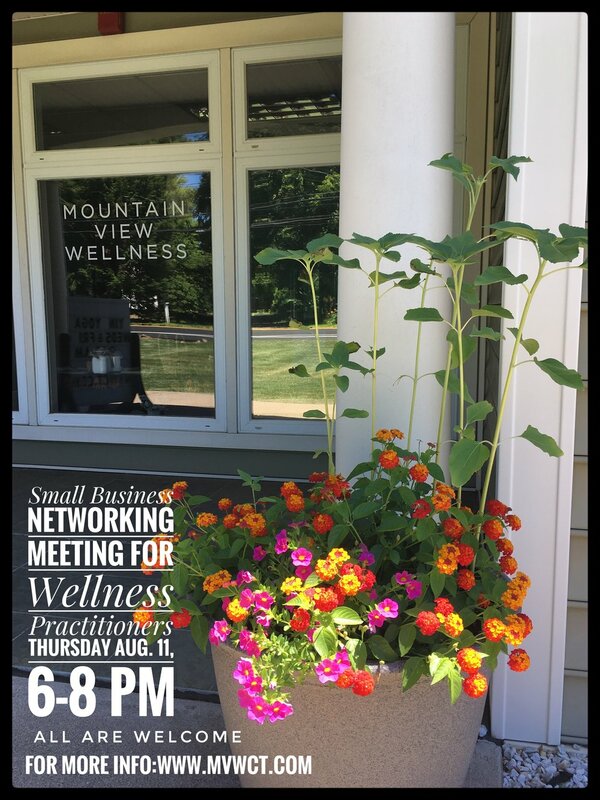 Please join us for our first ever Small Business Networking Meeting, Thursday Aug. 2nd, from 6pm-8pm. The cost will be $10 ($5 will go towards a scholarship fund for a Hamden High senior studying business).